From "Polly Apfelbaum: Nevermind — Work from the ‘90s” at the Worcester Art Museum. Detail from “Wonderbread” (1993), crushed synthetic velvet and fabric dye. Detail from “Fine Flowers in the Valley (White Spill)” (1992-93), crushed synthetic velvet, cotton sheeting, fabric dye, safety pins. 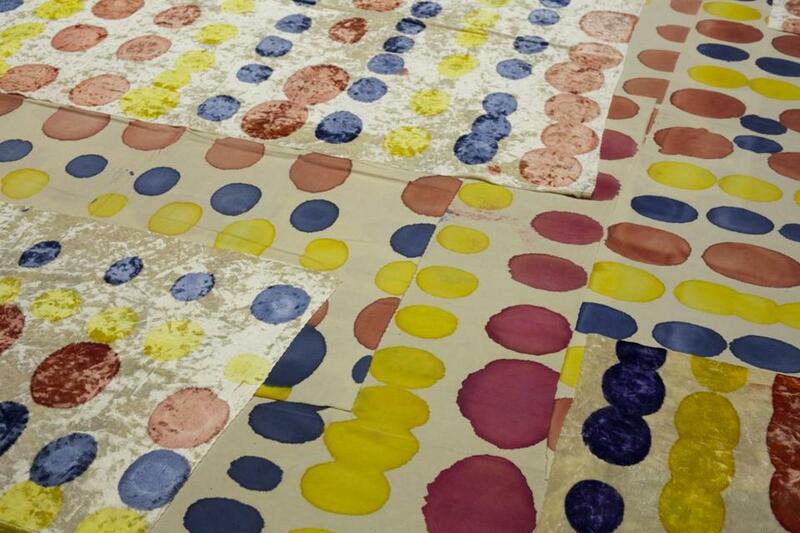 WORCESTER — Back in the 1990s, Polly Apfelbaum’s paintings moved to the floor. She called them “fallen paintings,” evoking “fallen women.” Made of synthetic velvet, colored with fabric dye, and now on view at the Worcester Art Museum, they wink and shimmer. They beckon and flirt. They’re slinky, sometimes crumpled, usually stained. You can’t miss the feminist references in her language, nor in her materials, but Apfelbaum was also challenging the bounds of painting itself. “Polly Apfelbaum — Nevermind: Work From the ’90s” visits a moment when profound shifts were happening in art. Site-specific and installation art brought new focus on creating environments for viewers, in contrast to the hermetic experience of gazing at a discrete object. Paintings popped off the wall and addressed viewers in new ways. Apfelbaum’s fell. “Nevermind” is smart, assured, and, in the end dizzyingly gorgeous. It’s the last exhibition organized by Susan Stoops, the museum’s estimable curator of contemporary art, who left earlier this month. Stoops had been in Worcester for 15 years; she had overseen the terrific, large-scale installations in “The Wall at WAM” series over the Renaissance court. Her exhibitions, including outings by Louise Bourgeois and Tony Feher, were thoughtful and moving. In an e-mail, Stoops said she was leaving because she takes exception to the direction the Worcester Art Museum has moved since its acquisition of the Higgins Armory Museum collection earlier this year. The shuffle to house that collection has resulted in a squeeze on exhibition space, and the gallery in which Stoops has staged shows during her tenure will no longer be dedicated to contemporary art. The situation is temporary, says Juliane Frost, the museum’s manager of marketing, communications, and design, but will last a few years while the ultimate home of the armory collection — now the museum’s library — is renovated. She adds that plans are in place to incorporate contemporary art installations throughout the museum. Exhibitions of contemporary art in the galleries will continue, although perhaps not with the same regularity, and a new contemporary curator will be hired. Stoops has a particular interest in feminist art, and Apfelbaum’s show springs from her aesthetic sweet spot. But despite the artist’s droll references, sexuality is only implicit in these abstract works. 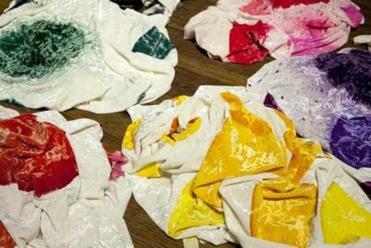 It’s her process that feels renegade: She blots dyes on fabric, then she cuts the fabric up to show off the blots, and arranges all the stray pieces to her liking. 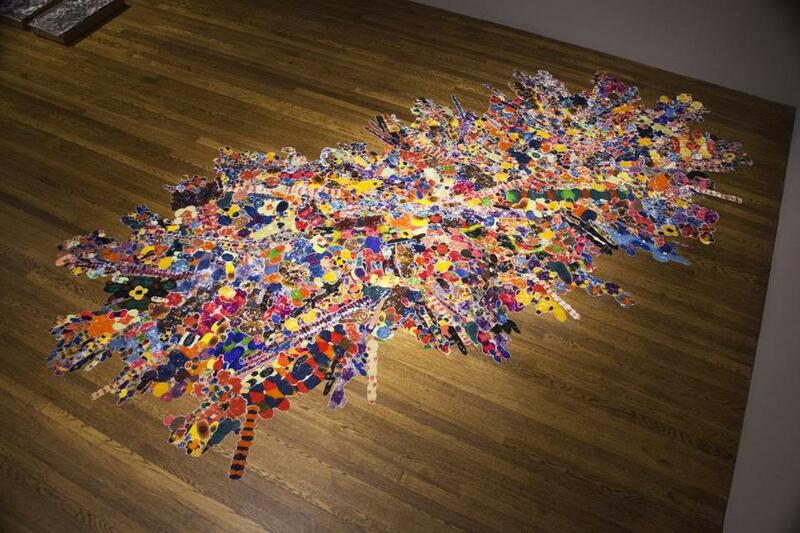 “Nevermind” traces Apfelbaum’s evolution from 1992 to 1997, as her vision developed toward the exuberant paintings — she calls them “splats” — that characterized her work for years after. It begins with “Cinderella,” seven low rectangular cardboard boxes, each with folded gray velvet on top. The repetition of the boxes recalls work by minimalists Donald Judd and Carl Andre, but the folded velvet is a sharp detour. Velvet plays mischievously with light. It’s tactile, imperfect, and luscious. The folding echoes domestic work: a strong tinge of the feminine, which the title gives away at the get-go. Next, the artist eschewed her cardboard supports and went straight to the floor. “Fine Flowers in the Valley (White Spill)” features several lengths of white crushed velvet, each blotted with a particular color family. The artist crumpled the fabric on the floor in the corner of the gallery in a partial star pattern. Apfelbaum arranges each piece anew every time it’s displayed. That, too, flies in the face of the revered discrete art object. These works come together and they come apart. They’re conditional, ever malleable. In the context of this exhibition, however, with its progression to the spectacular splat piece “Blow Up,” it’s hard to see “Fine Flowers in the Valley (White Spill)” as fully realized; it’s a step toward the artist’s own flowering. Detail from “Blow Up” (1997), crushed synthetic velvet and fabric dye. its yellow, blue, and red-dot patterns like that on the bread package, lies flat on the floor arranged in layered sections, some with the velvet side up, some with the matte side up. The blots seem to want to bust out of their simple pattern as they bleed, smear, and crowd. “E,” titled for Georges Perec’s 1969 novel “La disparition,” which omitted the letter E, likewise balances order and chaos. It comprises strict bars of color, each containing small errant blots as varied as fingerprints. But here those blots break out. They’re no longer simply dots; they’re all shapes, cut along their contours, independent of one another. When layered, they play, and the bars of yellow, brown, red, and blue become sumptuous, flickeringly unpredictable. From there Apfelbaum’s next step looks clear: Ditch order. Embrace chaos. “Blow-Up,” the first of Apfelbaum’s splats, lies on the floor like one of Jackson Pollock’s splatters — wild, energetic, streaky, and drippy. She made it (and reassembled it here) with hundreds of cutout pieces of blotted velvet — circles, biomorphic dollops, centipede-shaped bars, which squirm and glow and fall into shadow as you move around the piece. It’s masterful. Falling cracked something open in Apfelbaum’s paintings. 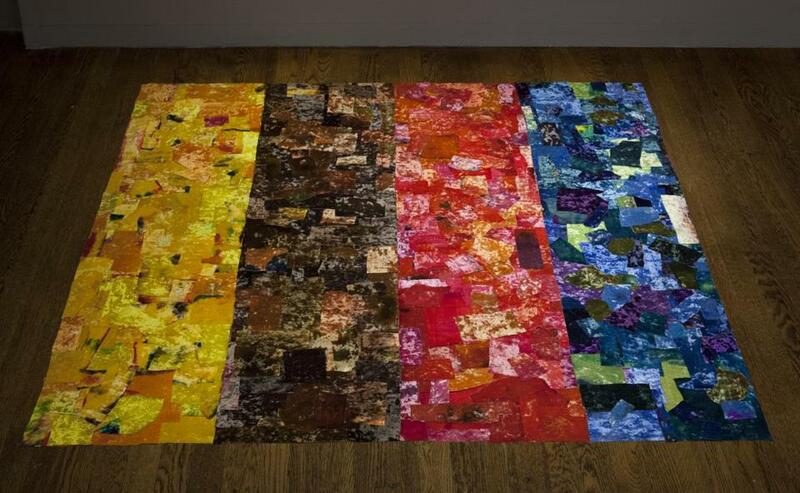 This exhibition charts her process as she grappled with what that was — the glean of the velvet, the way it hugged the floor, the way dyes worked on it, and the way she herself was gobsmacked by color. In the end, she harnessed it all — and here unleashes it on us. Detail from “E” (1995), crushed synthetic velvet and fabric dye.